Sale-A-Bration has started, so until March 31, every order over $50 (before tax and shipping) earns you a free stamp set or designer series paper pack! (Orders over $100 earn 2 items, etc.) This year’s SAB items are so much fun! See the SAB brochure PDF here. The Occasions catalog (PDF here) has also premiered. I’m usually all about the Holiday catalog (oh, how I love it), and I really don’t get into flowers much, so the Occasions catalog is usually not my thing. But this year, there is so much in it that I love! The DSP in my card above is from the Occasions catalog (It’s My Party 12×12 DSP stack), but the real star… just lookit that honeycomb embellishment. And the little chick is from the SAB stamp set Honeycomb Happiness; the three image stamps in this set coordinate with the honeycombs. The honeycombs come in Blushing Bride, Mint Macaron, and white. I spritzed the one on the card with a Crushed Curry and water solution and let it dry before I added it to the card. Adorbs, right? 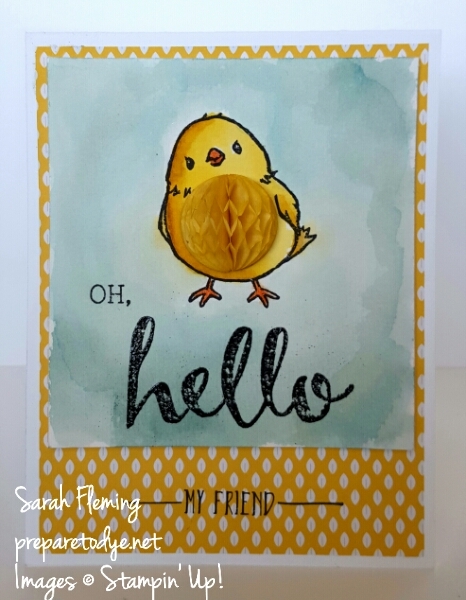 The sentiments are from Honeycomb Happiness (just the “OH”) and Hello, also a SAB set. I love both of these! You can buy *some* of the things you see in my online Stampin’ Up! store. The rest you can get FREE during Sale-A-Bration!! Order through my store, or email me!